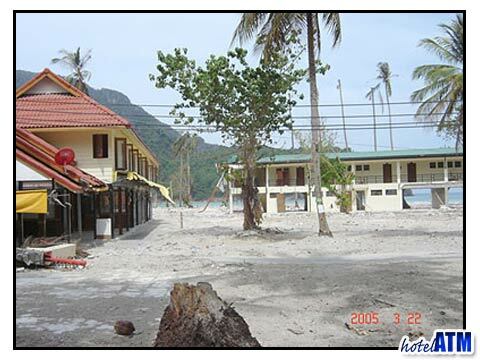 Life for those who are from Phi Phi Island will never be the same after the Indian Ocean Tsunami of 26th December 2004. All to many families lost loved ones and friends to one of the most extreme forces of nature. The destruction in some areas was absolute the lives and livelihoods destroyed in minutes. How does a community cope with such a loss? The answer for Phi Phi Island has been the community; a shared ordeal suffered and coped with as a group. As you went about the village, the stories of the 2004 tsunami mixed with the greetings of those who were still returning. If people hadn't met since before the tsunami, the catch up talk was of who they knew that had made it and those who did not survive. "Where were you when the tsunami hit?" was the most heard question of the early months of 2005. In the days straight after the tsunami the question were "Have you seen?" "Do you know where ...is?". These were the continual laments of the grieving who clung to the hope that there were survivors on the island or misplaced family members rescued and in a hospital in the towns. The first 10 days was chaos, filled full of human misery. The clear up started almost immediately but the first job was to collect the bodies and this was initially done by the Thai Police. The International volunteer services who came later made a super human effort to reach any who might have survived but this number was very small. Many have commented on how long it took to get the heavy equipment (trucks and diggers) in to clear the rubble of the village but Phi Phi Island was on the wrong side of Thailand and there weren't enough 50meter barges on the western seaboard for the scale of disaster that reached up the breadth of Phuket and Khao Lak. Within 5-6 weeks the majority of the rubble had been cleared. When many Phi Phi people asked how they survived, they recount incredible stories of luck and blind chance as they missed being engulfed by the raging wave full of the ripping and destroying debris of village. Then ultimately they refer to the loved ones who didn’t make it. Everybody had a story, everybody remembers where they were on that morning the day after Christmas 2004. Grief and morning was not seen in the village but lived behind closed doors. The memories were near to the surface and often re invoked in family gatherings for months and years after that morning. Many Thais feel connected to the spiritual world and it is not too great a leap of faith to believe in ghosts and still many are very uncomfortable about not venturing out at night on the beach areas where the wave first struck. Some locals see apparitions or dream about those who died. Many Phi Phi residents have not come back to Phi Phi Island as the memories were too painful, the fear too great. Many were re housed in Krabi Town the key Provincial town on the mainland. 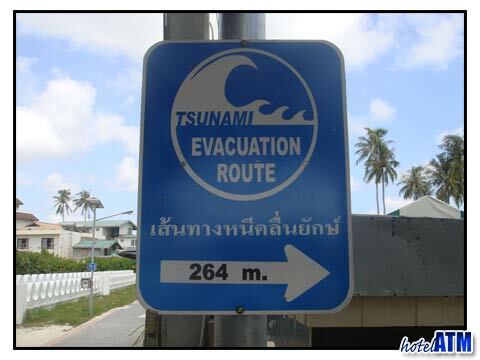 In time and by 2007 a Tsunami village has been built on Phi Phi Don, high above sea level far away from the main village, behind the Phi Phi Ayaraburi Resort to house a village decimated by a freak of nature. These 2 level simple houses are built in nice straight lines but do not have any of the charm of the old village but the local people do not mind as they have a safe refuge and that is a prized thing in an uncertain world. The Phi Phi Tsunami charities who helped the local Phi Phi people are worth a mentioned here. Hi Phi Phi (Help Phi Phi) helped a lot of individual families rebuild their homes and after this initial phase helped the business start up again so the Phi Phi People could start to help themselves. Many of the businesses supported entire extended families on the mainland and when there income from their Tourist business stopped overnight it left many without. Luckily Phi Phi island had been quite prosperous for many years and so the families used their savings. However money issues soon came to dominate the secondary problems and seemed to add to many in their miserable situation. The volunteers and the international Charity Organization Staff started to pull people back to Phi Phi Island. These westerners came to either physically help, paint, wire plumb a house or work with the island officials to help distribute charity and aid money. These volunteers then made the argument that tourists should return to the island to help the economy. If people didn't or couldn't volunteer the best thing for the island was to get tourism going as this would help the islanders have an income again and keep their mind off the tragedy.